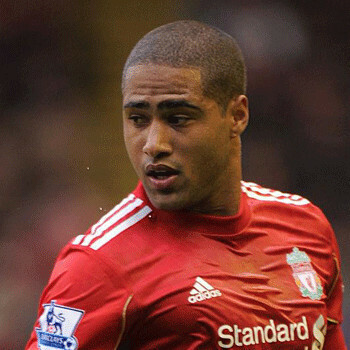 Glen Johnson is an English professional football player who plays as a right back for England National team and also for Liverpool F.C. He joined Liverpool in 2009. He was born in Greenwich, London, England. He attented Temple Hill Primary School and Leigh CTC School. He began his professional football career by signing for West Ham United when he was just 15 years old. His real name is Glen McLeod Cooper Johnson which he took from his mother's surname after separation of his parents. Once when he was just child he lived in hostel because his mother had nowhere else to live. Regarding his personal life Glen is married to Laura Johnson. Couple has given birth to two children including one daughter and one son. His children's name has not been disclosed yet. He was the part of Liverpool FC team when they won League Cup 2011/12. He is also awarded with many awards like Portsmouth Player of the Season Award 2008/09, PFA Team of the Year 2009. Sadly he was named as The Worst Player of the Year from 2002 to 2010 sequentially. Lucas Neill is a professional Australian football player who lastly plays as a defender for Watford. He also represented Australian NAtional team in 2006 and 2010 FIFA World Cup. LeRoy Ellis was an American professional basketball player. In his NBA career he have played for Los Angeles Lakers, Baltimore Bullets, Portland Trail Blazers, Los Angeles Lakers and Philadelphia 76ers. American football wide receiver for the Indianapolis Colts of the National Football League (NFL) who played college football at FIU, and was drafted by the Colts in the third round of the 2012 NFL Draft.